Brave Girl Bible Stories an exciting new brand and storybook to help girls grow into brave, confident daughters of the King. Young girls will grow in their knowledge of the Bible and in their faith by getting to know our Brave Girls—Hope, Gracie, Glory, Faith, and Honor—five modern-day friends who relate to today’s readers! The girls are each very different, but they all love Jesus and love each other. They share their strengths and struggles and how they discover bravery in women in the Bible. 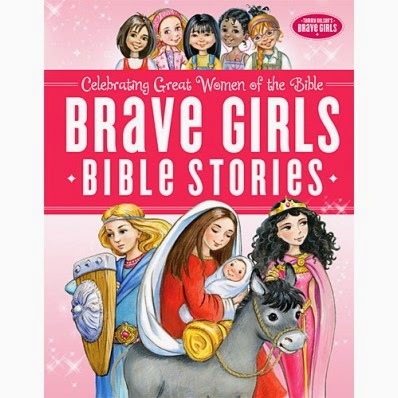 In this full-color, illustrated Bible storybook, the Brave Girls help readers learn important lessons from more than thirty women in the Bible. Firstly in the book, we meet the Brave Girls! Each one is unique and has a story to tell. The book is divided into Old and New Testament. Each story involves one of the girls sharing some of their own story, and then weaving the Bible story into it. Not only the Bible Story, but making sure to include God and the salvation message of Jesus in each story. After that we get another short look at what the Brave Girl thought about the Brave women in the Bible. She also says a prayer that your Brave Girl can follow. What an encouraging book for young girls to share not only in the Bible stories, but to see a girl their age sharing her thoughts as well. Very relational in bringing the scripture alive for these young girls.